Back in the day they were handed to all servicemen, bonding them all together as members of the US Armed Forces. However, over time the coins would take on a new context. According to one story, challenge coins date back to the second world war and were first used by Office of Strategic Service personnel who were deployed in Nazi held France. The coins were simply a local coin used as a "Bona Fides" during a personal meeting to help verify a person's identity. There would be specific aspects such as type of coin, date of the coin, etc. that were examined by each party. This helped prevent infiltration into the meeting by a spy who would have to have advance knowledge of the meeting time and place as well as what coin was to be presented, amongst other signals, as bona fides. 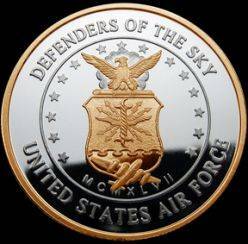 Browse this selection of the most sought after challenge coins, and get started today collecting these very special coins!